Ignite a vision for equal opportunity. To encourage young women to have big dreams and pursue them. To believe that anything is possible. 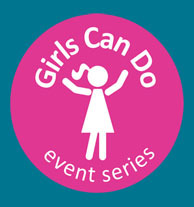 The purpose of Girls Can Do is to host events around the country and the world, at low cost for young women and girls. Our events are special days where girls come to engage, connect, and share experiences with amazing women speakers who are pursuing their dreams. At each event we offer access to dozens of year round programs through our Girl Partner Network. These programs are the “next steps” for inspired Possibility Thinkers. Learn more about our mission and our impact. Watch our Public Service Announcement! Thanks to KOMO 4 TV for producing this fantastic Public Service Announcement video for us.